Welcome to Wholesale Donuts. Our team of professionals are here to serve your business with fresh (made daily) food products. Give us a call and let's sell some Donuts! Looking for a partner to help you grow your revenues? We are established, have distribution lines in place and a long and successful history of working with every size of business. Wholesale Donuts has been servicing customers from South Bend, Indiana to Kankakee, Illinois and up to Chicago for over 30 years. Our past and current clients make up a Chicagoland "who's who" in retail food sales, including but not limited to Dunkin Donuts, Speedway Gas Stations, Chicago train stations, Family Express, Luke Oil, Circle K and many, many other local firms. Our organization creates stable sales for our clients by helping to pull in and retaining customers. People come for the donuts, but often buy a variety of other products while in the store. 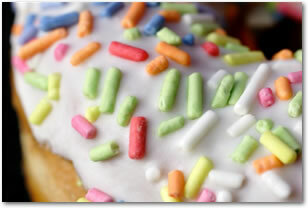 To help get you off the ground and selling donuts, we offer bakery bags, donut boxes, tissues, and display cases. Note: The minimum delivery size is only 18 donuts! Please contact us today to discuss opportunities in the donut business. Wholesale Donuts services South Bend, Laporte, Gary, Merrillville, Portage, Demotte, Hammond, East Chicago, Chicago, Kankakee and many other Indiana and Illinois towns and cities in between. Copyright © Wholesale Donuts Inc. All Rights Reserved.